And, facetiousness aside, "doing what's easy" is the point in all this. People cycle in large numbers where you make it a really easy thing to do. 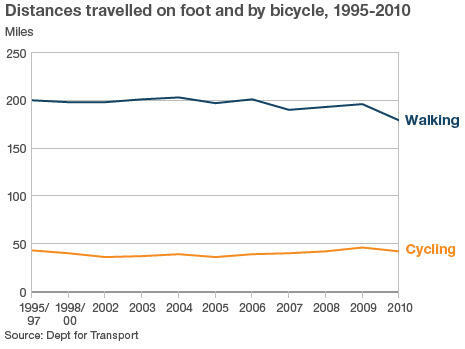 People cycle in small numbers in the UK because we've made it a really, really hard thing for people to do. The many ways we have made it hard are well-described in sociologist Dave Horton's excellent blog series Cycling Struggles, based on research he conducted for the University of Lancaster's Understanding Walking and Cycling project. As I've argued before, telling people how good it is for their health to cycle, or that "gardening is more dangerous than cycling", or some such blather, is utterly useless as a strategy for getting more cycling. The only strategy that we know works is to make cycling easy, convenient, safe, pleasant, and fun. Ensure pedestrians, cyclists and users of other modes of transport that involve physical activity are given the highest priority when developing or maintaining streets and roads. since 2008. Perhaps I have been looking in a different direction when it has all been happening, but I haven't noticed much evidence of any level of government following that guidance. And, overall, the actual policy guidance in this latest NICE paper seems to be rather less clear and concrete than that from 2008, if lengthier, with rather a lot of emphasis on "encouraging" cycling, and no real analysis of the infrastructure problem. So perhaps those pinning big hopes of a shift in policy in response to NICE's current paper need to prepare for a let-down. Again. And I'm afraid "a let-down" is what Norman Baker's announcement must be viewed as. Part of the trouble is, of course, that the sum is just too small, spread across the whole of the UK, to make a difference. In the London Borough of Brent, where I operate, the Transport for London-declared "Biking Borough", with a 1% modal share of travel by bike, I could easily tell you how to spend that £20 million, just in my borough, tomorrow. You could, with that money, maybe fix a couple of major physical barriers to cycling, and you'd probably succeed in increasing cycling in the borough by between 50 and 100%, I'd guess (my guess based on comparisons with comparable London boroughs which have slightly fewer physical barriers to cycling). But that would be just for Brent, for 300,000 people. That's 0.5% of the UK population. So this money, spent in that theoretical way (which it won't be) would at the very best achieve a 0.5% increase in modal cycling share in the UK, from around 1% to around 1.005%. That's not a measurable difference. Of course this money will actually be spent in much smaller lumps than I am proposing, on small projects all over the country. Norman Baker and many others would therefore argue that my analysis is totally irrelevant. There may be, or there are, they would say, many small barriers to cycling all over the country which could be fixed with small applications of cash, and that fixing these would have incrementally have much more effect than I am calculating. But I don't think so. I think the reverse, based on everything I have seen of the barriers to cycling in the UK and of what works and what doesn't work. I think the more you subdivide small funds using the traditional "scattergun" approach used in the UK for cycle investment, the less bang for your buck you get. You need to create consistent, widely-useful networks in towns to get people cycling as a matter of habit, as the Dutch showed in the early 1970s. If you've got little money it's better to do one "demonstration town" than waste it all through "evaporation" across the nation. Unfortunately this money is a drop in the ocean compared to what we need, and through being a minutely subdivided drop, its benefits will entirely disappear. Projects could include better cycle facilities at railway stations, improved cycle links, or projects to improve the layout of road junctions to make them more cycle-friendly. Previous investment has seen some great projects making a real difference in communities, including better cycle routes from residential areas to schools to encourage the next generation of cyclists to cycle more regularly. It sounds like this money will be used for a few more cycle stands at stations (but lack of cycle parking really is not the reason people don't cycle, it's lack of subjective safety of the cycling experience, so this part of the money will achieve little), a few improvements to Sustrans-style routes between towns, and possibly junction changes, though that these will be done well enough to work is unlikely given the terrible nature of current DfT guidance on cycle infrastructure (more good reading on that subject here). It also sounds from that press releases as if the DfT doesn't really know exactly what it wants done with this money. I think it's important to note that other areas that DfT funds are not treated like this. For major road and rail (and I guess aviation and maritime) projects, the government first decides exactly what it wants. It then costs it, and decides if and how it can be done. It then gets it through the planning mechanisms, if necessary bypasses them by executive decisions or new Acts of Parliament, and sees the project through, spending as much money as is needed to finish it and make it work. By contrast, cycle projects are rarely completed to the standard to actually make them work optimally. I think today's announcement is undermined not only by the smallness of the sum involved, but also by the continuing lack of a coherent strategy from the DfT for cycling, and the lack of decent standards written into DfT guidance to Highway Authorities to tell them exactly how to build for cycling. The point about the Netherlands is not just that they spend at least 20 times as much per person as the UK on cycling infrastructure, and not just that they have been doing this consistently for decades, but also that from 1989 they had a clear national plan (the Dutch Bicycle Master Plan). There have been various announcements about funding relating to cycling from the government over the past year. It's been hard to keep track of them, as the same money tends to get re-announced over and over again. In March £15 million was announced for cycle-rail and Sustrans projects, and in June £15 million for junction improvements in London and £15 million for the same in the rest of England were announced. If we add these to today's money it looks like the DfT is putting about £65 million into cycling infrastructure for England, about £1.30 per person, this year. This may be compared with the budget that Cycling England had from the last government: £60 million. But that money was spent in only a few towns, in a more concentrated way, to try to demonstrate the effect of doing a lot (by UK standards) in one place (a more effective strategy, though it still didn't amount to the creation of the whole-town quality networks that the Dutch showed were necessary). A scattergun £65 million is not worth anything like as much as Cycling England's more concentrated £60 million. And there has been inflation since the days of Cycling England, abolished in the "Bonfire of the Quangos" as one of the first acts of the Coalition government. The bottom line seems to be that the funding for cycling in England stays about constant over time, whoever is in power. And the cycling level stays constantly low, as you'd expect. You keep doing the same thing, you keep getting the same result. There's no shift from the historical pattern here, there's just not the gear-change we need present in today's announcement, or the announcements over the past year. We need a billion a year, just to start to get the momentum up, just to start to catch up with our more advanced continental neighbours. And we need proper standards based on international best-practice and a hard, scientific analysis (that people like Dave Horton should be in the front line of advising on) as to what really works (and that, by the way, is, in one word, in case you were in any doubt, segregation, not the deeply-misleading "mix if possible, separate where necessary" mantra that everybody seems to have gotten hold of suddenly.) And the catching-up would still take decades. A billion is getting on for 10% of the DfT's budget, after the recent cuts, of £11.6 billion. The direct costs of obesity to the UK are estimated by the Department of Health at £5.1 billion a year. On that basis, the request for a billion for cycling is rational and reasonable, given its potential for solving the problem, as detailed in today's NICE report, and its potential for solving many other problems as well, that we all know about. Could any UK transport minster, or even the Chancellor, possibly deliver a billion for cycling? In political terms, not easily. But posterity thanks politicians who decide to do things that are hard. The scope for the NICE guidance on walking and cycling specifically excluded national measures (e.g. taxation, speed limits, etc.) and infrastructure (which was covered in NICE's guidance PH8, on the physical environment. Anyone accessing the guidance online via NICE Pathways should find it links in seamlessly to the physical environment measures. The remit for the guidance was to identify the barriers which discourage people from cycling and walking locally, both for transport and recreation. The report has done a pretty comprehensive job on that and will form the basis for future work. One of the key issues in the new guidance is that it addresses the current situation where the costs of adequate infrastructure are incurred by a local authority in its highways/roads engineering budget but most of the benefits (real savings in health care expense from lower incidence of non-communicable disease) are enjoyed by the health service. The health economics assessment in the guidance showed that there was an excellent benefit to cost ratio for all of the investment made in the Cycling Demonstration Towns (CDTs). Even though we know that the CDTs delivered a very pale facsimile of the standards the Dutch achieve, in public health terms they were successful interventions. Of course the unanswered question is 'how many more people might be cycling if we were to 'go Dutch'. The other strong theme in the recommendations for promoting cycling, based on the research evidence and expert testimony, is that there is no single, magical intervention that delivers a step change in cycling participation. Whilst segregated cycle routes are the most visible element of the Dutch model there is far more which needs to be adopted, like their cycle training for school children, strict liability and their integration of cycling and public transport. Another important point in the guidance is that the focus should be on the two to three miles around where people live – because that represents the greatest opportunity for them to walk or cycle. In London there has been a massive concentration on the centre, with the cycle hire scheme and the blue painted routes into the centre. But what has been done for someone who wants to cycle from Kingsbury to Wembley or from Uxbridge to Heathrow? The guidance encourages local authorities to make cycling more accessible for people who live in the suburbs. That will mean assessing and improving roads to make them more inviting for cyclists, providing secure cycle parking at shops and public buildings and identifying routes to the places people may wish to visit by bike. I thought it was interesting that the Director of the Public Health Centre, Prof Mike Kelly drew the analogy with the public health programme to reduce smoking - how in the 50s the first paper published suggested there the link between tobacco and ill health and over the ensuing decades there has been progress so that smoking is now a minority activity. On a minor point, the Understanding Cycling and Walking (UCW) project was included in the guidance development process. Prof. Colin Pooley, who led the project, gave expert testimony to the committee and a member of the UCW project team, Tim Jones, was a member of the committee. Don't just focus on central government. There is nothing stopping local authorities from at least showing intent to invest properly in cycling - they just have to submit a proper network as a 'major local transport scheme'. While this is true, I would like to hear of any examples where this has actually happened. The problem, in my experience, is that local authorities have far too much else on their plate and lack the staff capacity and expertise to push such ideas, particularly following the massive cuts this year. The most they tend to attempt is small, piecemeal interventions in the guise of "safety schemes", which are driven by the idea of reducing casualties for all road users rather than making roads more attractive for cycling, and so they often result in "safer" roads actually less attractive for cycling (e.g. roads slowed and narrowed with pinch-points). You might expect the best chance of coherent cycling plans from the biggest authorities outside London, such as Transport for Greater Manchester, or Bristol City Council, but there is precious little evidence of this from these cities. I still think the ball is essentially in the government's court. This is, indeed, why Cycling England was created. The experience of the last government was just that local authorities were incapable of driving concerted cycling strategies without a lot of external support. The concentration on "localism" remains the major stumbling block in the way Norman Baker is approaching this problem, in my opinion. I can see your point to a degree but, even with central government funding, the implementation still rests with local authorities, just as it did for the Demonstration Towns. Cycling England wasn't created to do the spade work; it was a programme management and funding vehicle. There is the capacity and technical expertise in local authorities, there's "just" not the motivation. Success does not depend on either central government or local government, it depends on both. I think you are letting local authorities off the hook a little! You're definitely behind the curve in expecting central government to drive cycling forward. For two reasons. First, because that was Labour's game plan and it foundered – there is a very long list of well-intentioned initiatives that were driven centrally but failed because many local authorities had neither the motivation or resources to take them forward. Secondly, the coalition government has set its stall out to promote localism. If you listen to any Conservative MP speak, you will hear words to the effect of 'we're not in favour of compulsion but choice'. They aren't going to be directive on cycling, particularly as only a minority of them have any enthusiasm for it. It appears that none of the car centric city planners even noticed the NCN route. With that level of commitment to encouraging cycling from the people who make the decisions what hope is there? The £20m is for England and so this equates to about £129k for each of the 155ish English highway authorities being very simplistic. This doesn't go very far, now does it? This new money is all very well, but councils have to (a) bid for a share of the funds and (b) then be capable of spending it in a way that actually benefits people riding bicycles for transport. Here in West Sussex the council has abolished the post of Cycling Officer, adjusted the Highways planning system so getting cycle schemes onto a wish list is even more difficult than it used to be, and expect cycle infrastructure to be funded almost entirely from Section 106 planning bribes. The likelihood of any of this new money finding its way to West Sussex is minimal, they can't even decide how to spend the £2.36 million awarded from the Local Sustainable Transport Fund even though they've already produced a costed bid document to win the cash! The point about top-level action is key. We will never see decent cycling infrastructure in the UK until the UK national government make it a priority. That will happen when the electorate suddenly realise what they've been missing out on, and that they've been tricked into paying over the odds for local transport (in money and in lives devastated) for decades. Think the experience of West Sussex is being repeated nationally with LSTF , hence the announcement of more cash through nationally managed (with sustrans) funding streams.